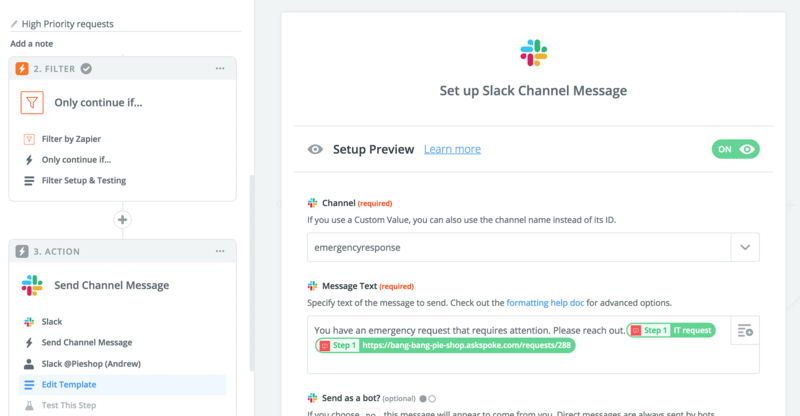 Many companies use Slack channels to communicate emergencies. This Zap sends an alert into the channel of your choice each time a user adds a request type marking a request as urgent. By enabling this Zap, your on-call channel will receive Slack notifications for any Request Type or keywords that fit your filter. 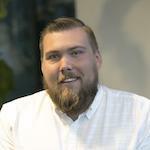 This allows you to automate pushing urgent issues to the on-call or emergency response channel. Start by setting up a Request Type that can be used in case of emergency. By creating a request type specifically for emergencies, you'll be able to filter Zap notifications by request type. Remember the name of this request type, we'll be using it once you log into Zapier. If you need help setting up a request type, you can find instructions here. Once Spoke is connected, choose the action "New request" so the Zap runs each time a new request is created. Once you have tested this step, select "+Add a step" and scroll down. From the list of actions, select "Filter." By adding a filter, you ensure that you're only receiving notifications for the emergency Request Type that you've just created. When building your filter, use fields from step 1 to connect this action to Spoke. Use "Request Type Title" from step one to filter requests based on the request type attached. You can add "And"/ "or" statements to your filter to expand the amount of requests that will trigger a notification. 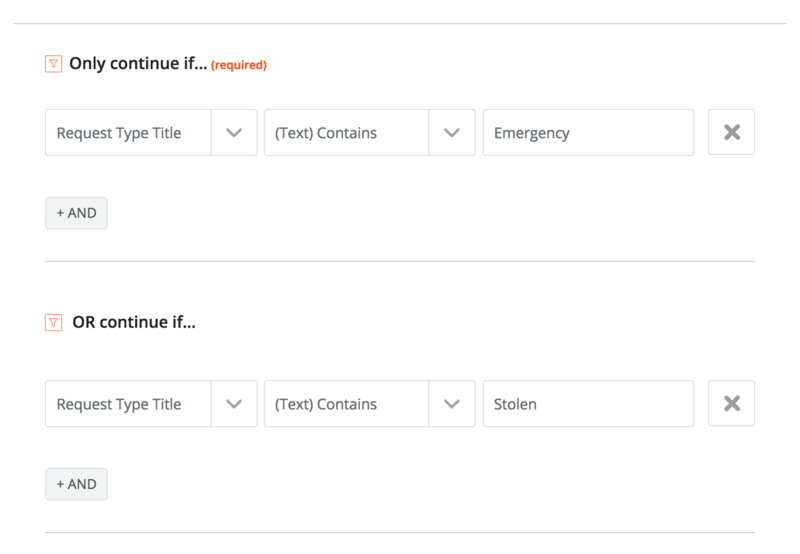 For example, if you also want to be notified if a user uses the Request Type to report an emergency, OR uses a Request Type to report a stolen laptop. Both notifications are allowed if I use an "Or" statement. 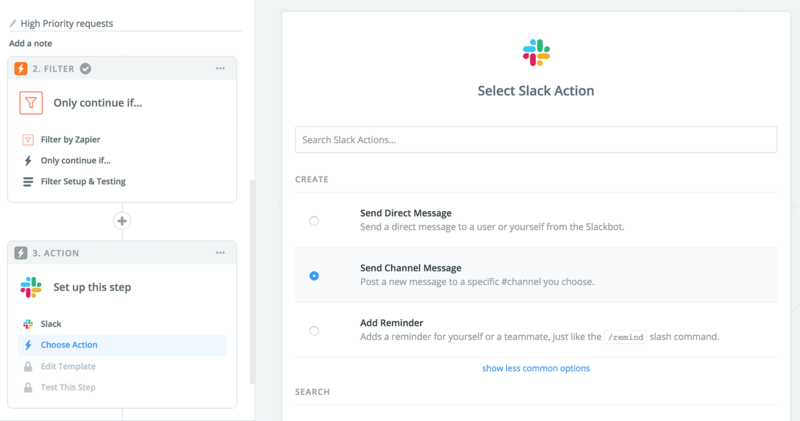 Once you have customized your filters adequately, again, select "+ Add another Step" then choose "Action"
Search for Slack and choose the action "Send Channel Message"
This way, everyone in the designated channel will receive a notification that an important request requires attention. Scroll down and select "Save + Continue"
In the Message text field - enter the message,then use "Hyperlink" from step one, to provide a link to each request. You can also use "Subject" from step one to provide some more context about the request. 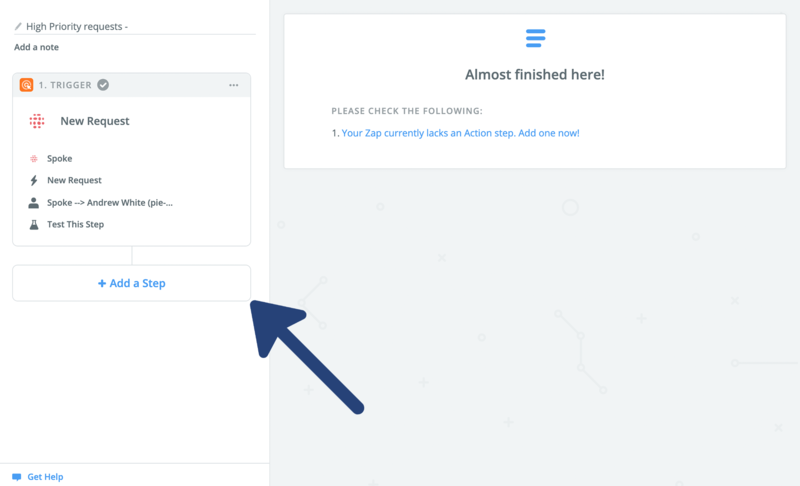 Once you have completed the Zapier template, make sure to test your Zap, to confirm it's working, then select "Finish." Make sure your Zap is toggled "On"
Now, each time a user chooses the Request Type that matches your filter, you'll receive an additional notification in the chosen channel.